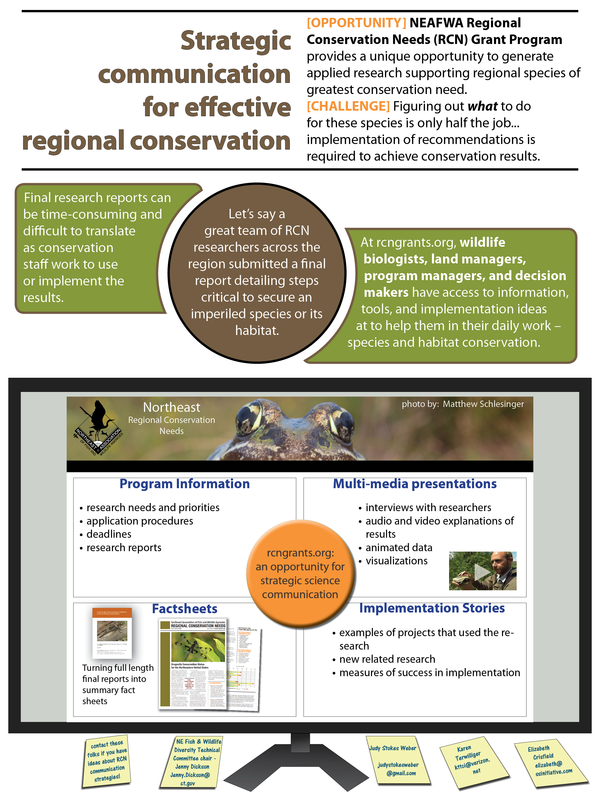 When requested, provide assistance to state agencies in determining regional species and habitats of greatest conservation need, the threats impacting the region, and the actions that could be taken at the regional scales to limit the impact of the threats and support populations of species of greatest conservation need along with other critical aspects of ongoing reginal collaboration. A sustained effort to facilitate the collaboration of representatives of the northeastern states to address issues of common conservation concern over the three-year duration of this grant. In general, the work will be accomplished jointly by the Northeast Fish and Wildlife Diversity Technical Committee NEFWDTC (reporting to NEAFWA) and TCI’s team with experience in SWAP preparation, northeast region conservation products, and northeast region conservation planning and coordination. In general, TCI will facilitate the work of the technical committee, provide the underlying research needed for their consideration and deliberation, and deliver reports documenting consensus. It will include general consideration and deliberation, and deliver reports documenting consensus. It will include general coordination that provides support for the RCN program (including continued coordination and outreach with such products as RCN fact sheets, committee reports and TRTL support). 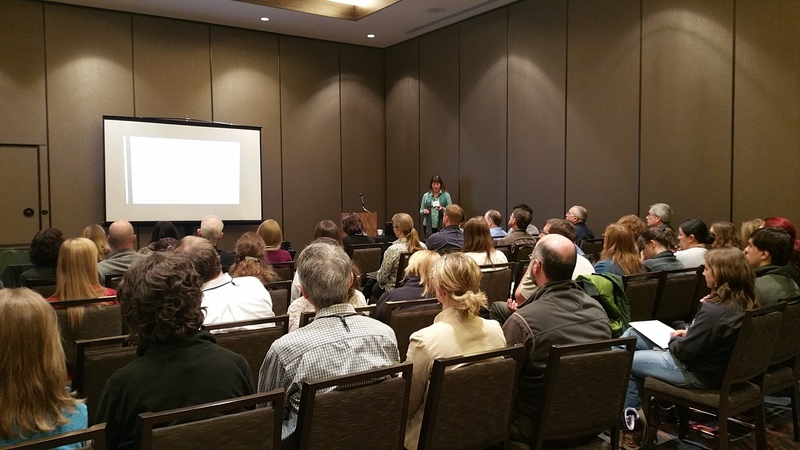 Terwilliger Consulting, Inc., and Northeast Fish and Wildlife Diversity Technical Committee. 2016. 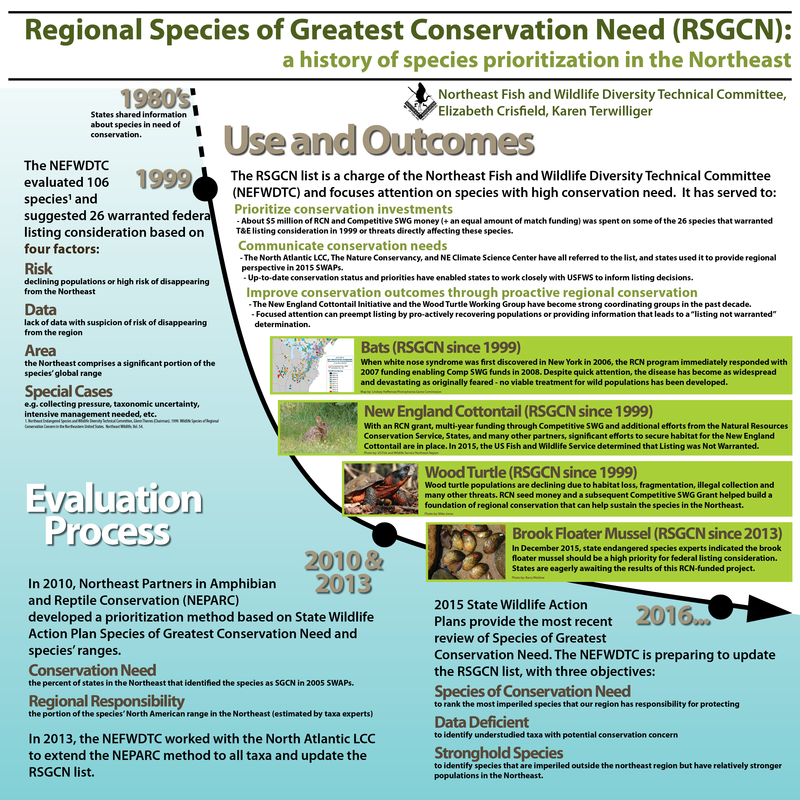 Preliminary Review of Northeast Region State Wildlife Action Plans. Terwilliger Consulting, Inc. Locustville, VA. Date downloaded." Presented the preliminary SWAP Roll up results to NE TWS in Hadley and the TWS in Raleigh NC on behalf of NEFWDTC.